Last weekend we took our LO to the library and I got myself some books on baking, salads and healthy cooking. I took home "The Sono Baking company cookbook as the pictures in this book were so tempting and the narration was simple to the starters as well as regular bakers, in short; Simple and neat. 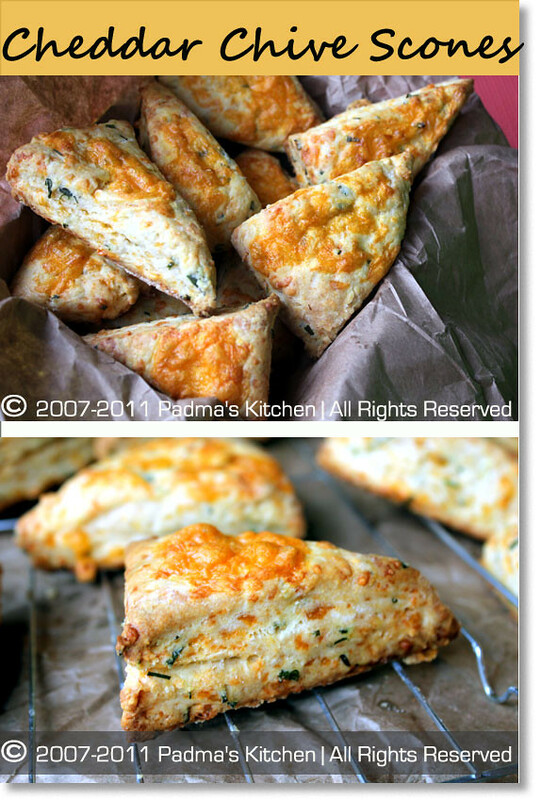 This scones recipe caught my eyes as it was not sweet ones but savory scones. 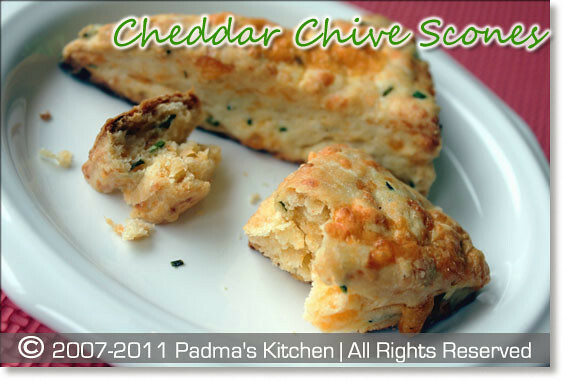 Cheddar Chive Scones are a delicious treat and when I was baking the whole house filled with the aroma of cheddar and chives. I was so eager to taste the freshly baked scones that I burnt my mouth....but it's all worth it!! The taste reminded me of the Khari biscuits we used to get from our Khariwala, (vendor) who came to our doorsteps with these fresh baked goodie. Perfect for any occasion, these basic savory scones can be served for breakfast, lunch, brunch or with tea. I like to use yellow Cheddar cheese for the color contrast, but you can white Cheddar as well as any other favorite cheese, including Gruyere or fontina. For more variation, try substituting thyme or another favorite fresh herb for the chives. I did very little changes to the original recipe by adding paprika powder and black pepper to it. Line a baking sheet with parchment paper or a nonstick silicone baking mat; set aside. Add 1 cup of the cream and fold with a rubber scraper or your hands just until the cream has been completely absorbed. Then continue adding cream, 1 tablespoon at a time, just until the dough comes together and there are no dry patches. Meanwhile preheat the oven to 400°F [205°C]. Turn the dough onto a heavily floured work surface like your counter top or such. Lightly flour your hands, pat the dough to an a circle almost ¾ to 1-inch thick; or you can shape it into a rectangle(¾ to 1 inch thick), which ever works best for you. Using a sharp knife cut the circle or rectangle into equal size triangles. Place it on the prepared baking sheet. Brush the scones with the remaining heavy cream (or milk) and sprinkle each with a pinch of grated cheese. Bake, rotating the baking sheet about two-thirds of the way through, until the scones are golden brown and puffed and the bottom are lightly browned when you lift the scones with a metal spatula, 16-20 minutes. Using a metal spatula transfer to a wire rack to cool. Enjoy it for breakfast, brunch or with tea. Omg, scrumptious and pretty looking scones, i dont bother to have some rite now.. In my opinion it looks very good and i`m sure it is delicious, so i think i will give it a try. Thanks a lot for sharing with us. Wow....they came out too good....worth to try...thanks for sharing this wonderful recipe Padma.